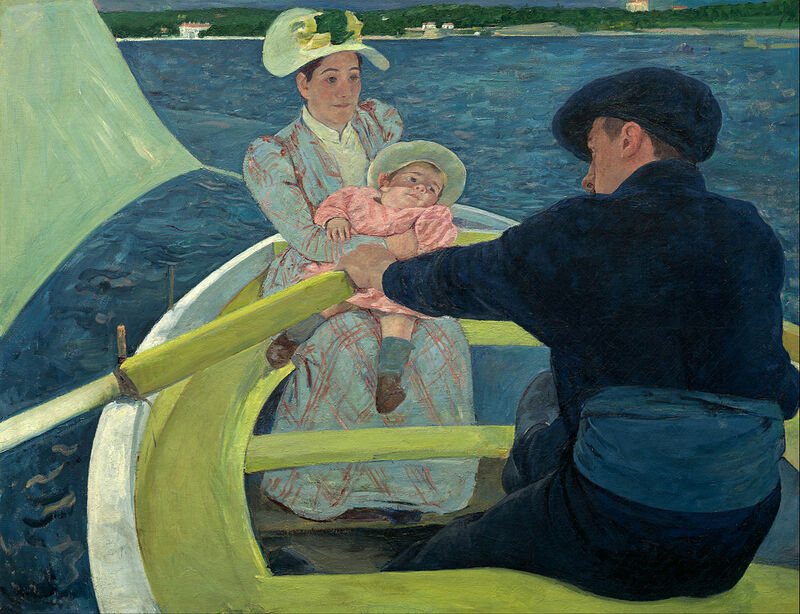 In 1877, the painter Mary Cassatt has reached a crossroads. The official Paris salon has just rejected her work, yet again, leading her to question whether her dream of being a painter is an egoistic fantasy. Back in Pennsylvania, her father thinks so, and since he’s supporting her life in Europe, he also thinks that gives him the right to tell his daughter–now in her early thirties–that it’s time to give up her foolishness and settle down to what a woman’s supposed to do. Not that she disagrees, entirely; Mary loves children and would like to have a husband and family, all other things being equal. But they’re not equal. With few exceptions, notably Berthe Morisot, Édouard Manet’s sister-in-law, a vivid character here, women don’t paint. They adorn canvases, share artists’ beds, offer admiration, and otherwise stay out of the way. Mary, as a foreigner, a real talent, and a woman unwilling to walk ten paces behind anyone, poses a threat to the fraternity of French painters, as a professional and a prospective marriage partner. At this critical juncture, when the personal and artistic paths seem blocked, Cassatt meets an artist she’s long admired, Edgar Degas. Right away, he tells her that she can paint but is wasting herself trying to ape accepted styles rather than find her own. To be successful, she must serve her obsession, whatever great theme drives her to put brush to canvas. These words electrify her, as does his rigorous devotion to his art, and since he despises social convention, he takes her more seriously as a fellow professional than many of their contemporaries. However, the social conventions Degas despises include sensitivity toward others, generosity, courtesy, kindness, keeping promises, or pulling together toward a common goal. He also has no love for anything or anyone other than himself and his art. Cassatt couldn’t be more different, so you know that whatever these two artists mean to one another, it will be a bumpy ride. Soon after, the men abandoned their plates for the candlelit corner next to the piano, where a few rested their elbows on its ebony skin and the rest sprawled in armchairs, twirling their delicate flutes of amber champagne, which they held by their stems. No one spoke, but they eyed one another as if waiting for a starting gun, boredom and anticipation warring on their spectral faces as the flickering candlelight painted shadows on the wall. Someone lit a cigar. Mary moved to join them, but Berthe motioned to her to sit beside her on a brocade loveseat away from the men. This tableau is like a painting, which could be titled Just Before the Verbal Fireworks. In what follows, Mary subtly bests Émile Zola, one way she proves that she belongs. But her struggle is never-ending, because that’s the artist’s lot, whether within herself, her profession, or society at large. I have to think the author is talking about writers too when she has Degas and Cassatt wrestle constantly with the “unbidden terror”: whether their work is as good as they think and hope it is, and whether the right touch will suddenly desert them, if it hasn’t already. The stakes increase for Cassatt when her father decides to move the family back to Paris (they had lived there in Mary’s youth). Though Robert Cassatt is no longer telling her to pack up her easel and come home to Pennsylvania, he’s an impossible man, and he’s there all the time. Demanding, selfish, self-absorbed, and dedicated to the proposition that if something doesn’t make money, it’s not worth doing, he’s poison for his long-suffering daughter, who expends much energy standing up to him. That she’s had to deal with him all her life makes her a match for Degas, whose faults loom large in these pages. Thanks to Oliveira’s fully rounded portrayal, I understand him. But I don’t like him one bit, and you have to wonder why Cassatt still bothers with him long after he’s burned her, and others, many times. There are other excellent artists within her circle, and she must have met many kinder, more sensitive men. Why, then, her fascination with a selfish boor? As an art lover, though, I admit my biases. Degas’s work has always seemed repetitive to me–ballerinas and bathers–and it’s hard to get around his rabid anti-Semitism, though, to be fair, Paul Cézanne and Auguste Renoir shared that prejudice. On the other hand, having seen too few of Cassatt’s paintings, I’d always thought of her as a minor artist, until I visited the National Gallery in Washington, D.C., a year ago. She’s very much the real deal–Degas was right about that–and I Always Loved You does her justice.